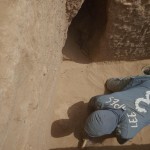 After the discovery of the shaft of tomb 26 on Tuesday, the cleaning of the shaft kept us busy in the last days and is still ongoing. 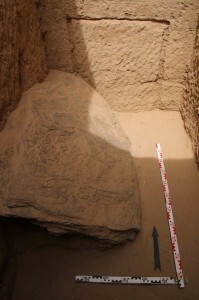 It is a roughly rectangular shaft, orientated north-south – we have currently reached a depth of 3.2 m. The filling was in the upper 2.5 m a sequence of windblown and very fine sand with several traces of flood levels between. Obviously the upper part of the shaft was refilled over a long time. It contained a good number of pottery sherds – ranging in date from the mid-late 18th Dynasty, Late New Kingdom to Napatan times – , small fragments of bones and several types of beads. 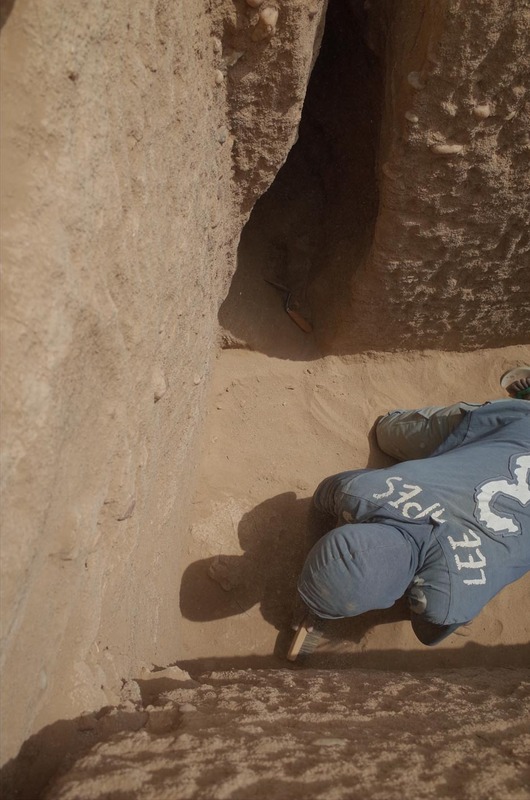 Mohammed carefully cleaning remains of a flood deposit in the upper filling of the shaft. Today we reached a level with a number of stone fragments in 2.5 m depth, large fragments of pottery vessels and a large quantity of scattered bone. The most dominant feature was a large schist slab set against the Northwestern corner, extending along the west wall of the shaft. Obviously it was one of the original closing stones of the shaft during the 18th Dynasty, but fell into the shaft at a later stage. The ceramics from this debris layer suggest a date after the 25th Dynasty – so possibly during the last phase of plundering before the shaft was left open for some time. One of the original closing stones of the shaft mouth was found collapsed in 2.5 m depth. 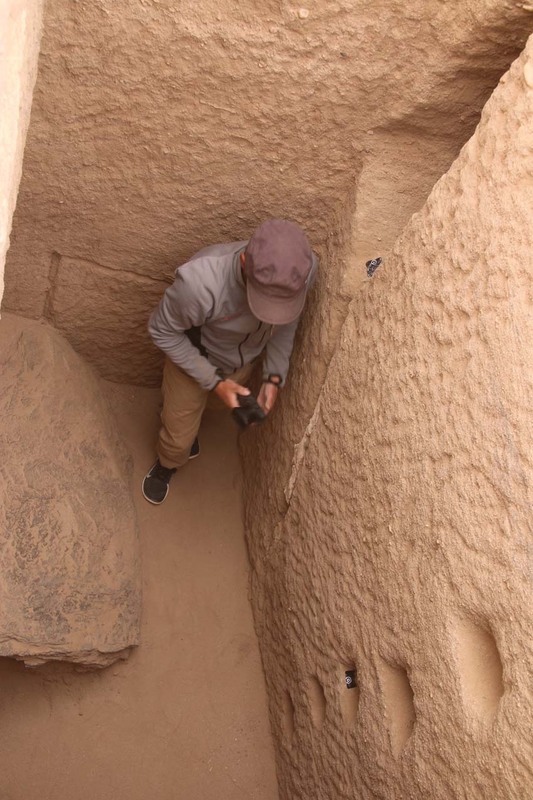 All in all, this collapsed schist seems important for understanding the use life of tomb 26 – Martin Fera documented its position with SFM. SFM documentation of today’s situation in the shaft. Another very interesting feature is an incised rectangular shape on the north wall, starting just a little bit above the slab – it resembles an opening to a chamber! Whether it was a trial and remained unfinished/was abandoned, or whether there is still a chamber below will become clear after this weekend! I am personally convinced that the chamber will open towards the north. 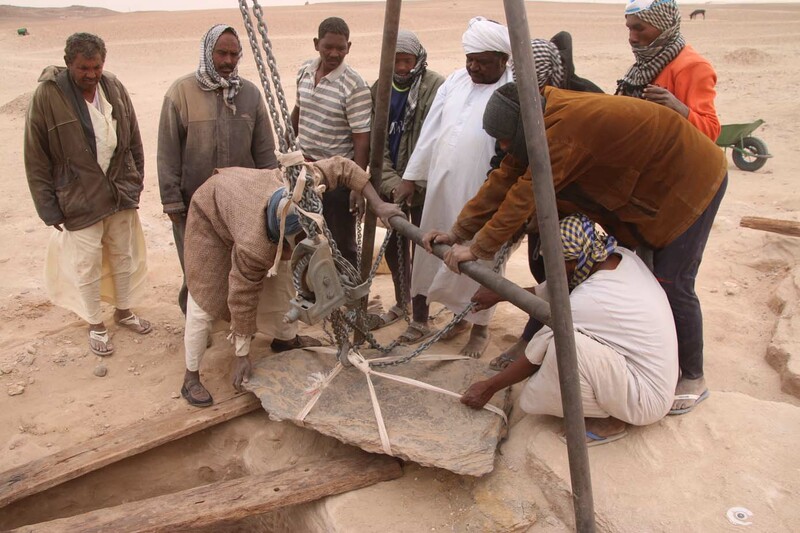 Thanks to the organizational skills of our rais Imad Shorbagi and the generous support of the local ferryboat crew we were able to get the equipment to remove the slab from the shaft – hopefully this was also a good training for dealing with more finds to come! Ready for a well deserved weekend: successfully removed the slab from the shaft!